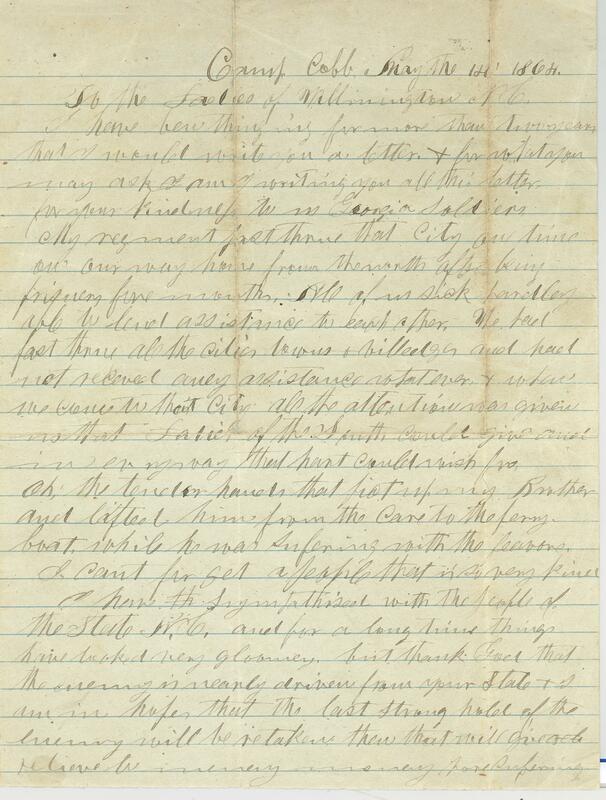 Item Description: This Civil War letter, dated 1 May 1864,was written by R.H. Hutchinson, a confederate soldier from Georgia, to the Ladies of Wilmington, N.C. In this letter, Hutchinson thanks the Ladies of Wilmington, N.C. for all of the kindness that they showed to Georgia soldiers when they passed through the city of Wilmington. 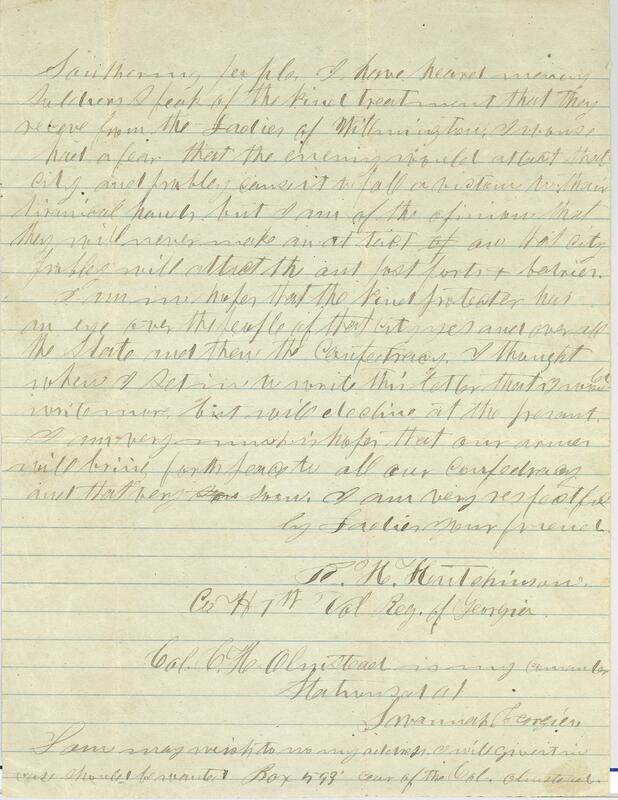 This correspondence also expresses sympathy for the confederate cause throughout the state of North Carolina. This letter was found in the DeRossett family papers, a prominent family of Wilmington, N.C. The DeRosset family was established in North Carolina in the 1730s with the immigration of physician Armand John DeRosset, a French Huguenot. Four generations of the men worked as physicians and merchants in Wilmington, N.C. Item Citation: Letter dated 1 May 1864,found in folder 61 of the DeRosset Family Papers #214, Southern Historical Collection, Wilson Library, University of North Carolina at Chapel Hill. I have been thinking for more than two years that I would write you a letter + for what you may ask am I writing you all this letter, for your kindness to us Georgia Soldiers. My regiment past thru that city one time on our way home from the north after being prisoners for months. All of us sick hardly able to lend assistance to each other. We past thru all the cities towns + villages and had not received any assistance whatsoever + when we came to that city all the attention was given us that Ladies of the South could give and in every way their hart could wish for. Oh! The tender hands that pict up my Brother and lifted him from the car to the ferry boat while he was suffering with the feavor. I can’t forget a people that is so very kind. I have sympathised with the people of the State N.C. and for a long time things have looked very gloomy but thank God that the enemy is nearly driven from your State + I am in hopes that the last strong hold of the enemy will be retaken then that will give relief to many many suffering Southern people. I have heard many Soldiers speak of the kind treatment that they received from the Ladies of Wilmington. I wonse had a fear that the enemy would attack that city and probley cause it to fall a victim to their tiranical hands but I am of the opinion that they will never make an attack on that city probley will attack the outpost, forts + barrier. I am in hopes that the kind protecter has an eye over the people of that city yes and over all the State and then the Confederacy. I thought when I set in to write this letter that I would write more, but will decline at the present. I am very much in hopes that our armies will bring forth peace to all our Confederacy and that very soon.